One of the reasons last month’s Civic Learning Impact and Measurement Convening in California was so familiar, even for this relative newbie to the community, was that the challenges faced by those dedicated to civic education and the teaching of critical thinking are very similar. As the experts at the event pointed out, while being an informed citizen certainly requires knowledge of government, civic institutions, history and other matters, it also requires a set of skills (analysis, decision-making, communication) and the dispositions to put that knowledge and skill to work. While critical thinking involves leaning a different body of knowledge (such as some form of logic, language skills that allow you to translate normal human communication into a structure that can be analyzed logically, and awareness of what is going on in your own head), one can only become a critical thinker by putting this knowledge to use continually through deliberate practice. Given that the amount of practice one needs to get good at skilled thinking is more than can fit into a single class, a person must at least have the disposition to want to improve their thinking, just as an athlete is motivated to train for success on the field. The mix of knowledge, skills and dispositions that defines civics (and critical thinking) makes it difficult to determine when mastery has been achieved. Traditional knowledge-based exams can certainly play a role in assessing student progress in either field, but the ability to measure enough meaningful aspects of what composes a citizen or critical thinker must go beyond the scalable, multiple-choice test. Citizenship, after all, is a lifelong project. Similarly, at least one researcher lumps critical thinking into the set of skills that requires 10,000 hours to truly master. Since no course in either discipline lasts thousands of hours, much less a lifetime, the only way education can influence people to continue developing their skills is to inspire them by showing the huge range of benefits they bring to themselves and the world through civic engagement and the ability to think independently and well. As a parting gift to my new civics friend as I prepare to move to another educational issue: your glass is more than half full! The existence of standards for social studies that start in Kindergarten (sometimes before) and continue through 12th grade means that every student in America is already required to dedicate a sizable chuck of over a decade of schooling to social-studies related topics. 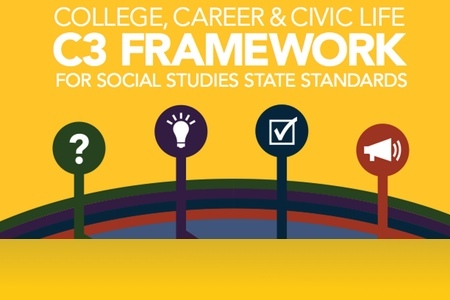 Now civics must compete with other social-studies subjects, such as history, geography and economics, and we are just at the start of getting those aforementioned standards to “grow up” and include ways of thinking and dispositions, best represented by the College, Career and Civic Life framework that many states are using to inspire updates to their state social studies standards. Of the “Core 4” disciplines of ELA, Math, Science and Social Studies, the latter is by far the most neglected and underfunded (even if we now realize the cost of ignoring it for far too long). But unlike critical thinking, which does not have (and may not need) a dedicated home within the curriculum, civics has a base to build upon.